This outfit you may have seen before if you read my JORD watches post, the floral shorts are a combination of rust and blue (Boohoo £6) and the cream cami is just a simple basic from H&M to pair with them. 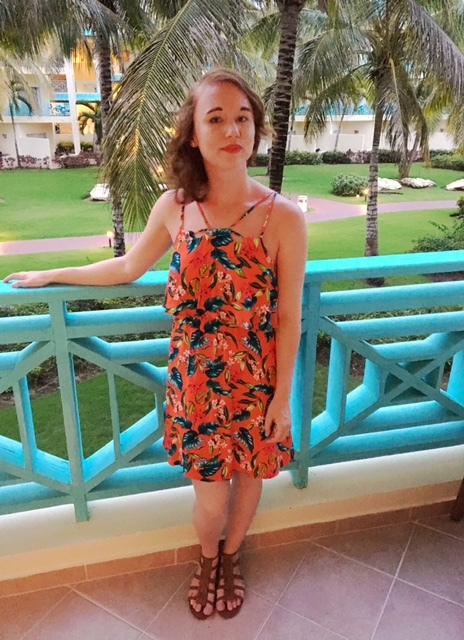 This tropical dress from Topshop was an absolute bargain at just £7 the print just screams Caribbean. Because the print is so loud I just styled it with my simple tan gladiator sandals from Tu Clothing. With similar embroidery to my bikini below, this khaki dress from Boohoo was only £12, with a criss cross neckline it is made for evening wear. The only problem I had is keeping the dress up as the straps were a little long but I still loved it! I also paired this with my gladiator sandals, as they are so comfy. This outfit had to be my favourite! Red, floral and lots of frills what's not to love! I bought the red dress from ASOS at just £16.50 it is petite too so it fit perfectly. Pairing it with my white cutout sandals from La Redoute made it look so elegant. For walking around the resort, I always opted for comfy denim shorts and loose tops. This red paisley cami is new in at Matalan at just £7, I particularly love the lace detailing and the print is so bright. For the final day, I really wanted to show off my tanned shoulders in this yellow off the shoulder top from La Redoute (£15 with discount) it matched this floral backdrop perfectly. I paired the top with denim shorts from Glamorous and sandals also from La Redoute. A holiday wardrobe isn't complete without swimwear and this year I wanted to buy a swimsuit and some high waisted 50s bikini bottoms which I did. The first bikini is all from ASOS, I particularly love the floral embroidery on the pants and the red really suits my skin tone. I felt very vintage too. The second look is a striped swimsuit from Primark (£12) and floppy hat (£4). The front has a deep plunge and lower back which I loved made me feel really comfortable. The final bikini is a tropical piece from ASOS which is very unique as it has a wire neck. I loved the look of this swimsuit but with sunburn it did start to hurt around my neck so I didn't keep it on for long. The great thing is because the bottoms are a combination green and black I can swap the top for a plain black top. Do you have a favourite holiday outfit? 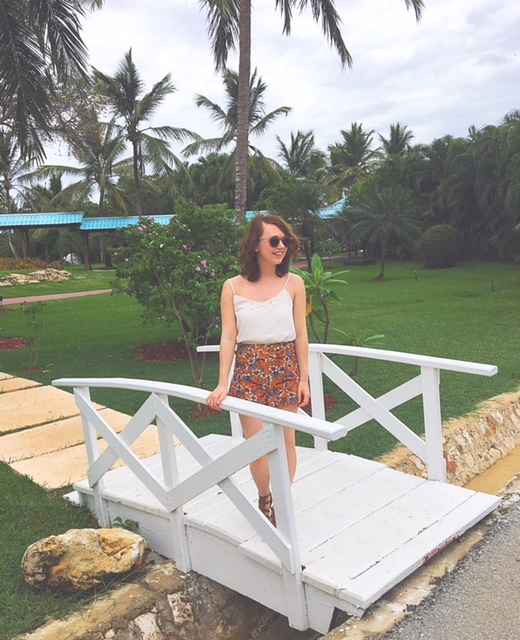 Keep an eye out for my Dreams La Romana Hotel review coming soon. This is a great post. Love your outfits they are all lovely. Thank you for sharing. oh my gosh girly, I LOVE that high waist swimsuit! I'm planning a trip to Hawaii soon and I may have to buy one just like it now hehe. Thank you for sharing! That SWIMSUIT THO!!! I am going to the dominican next month and I think I need it. LOL! 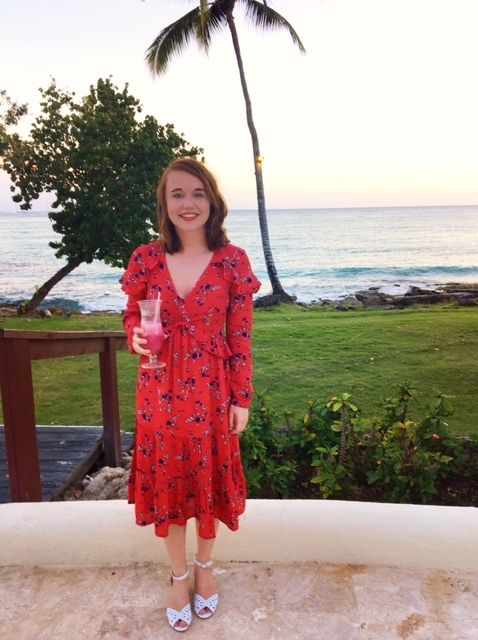 Your dresses are perfectly match with the Caribbean views, you are looking nice. You are looking nice, perfect snap for magazine cover pages.